Growth is taking place rapidly in all corners of the garden now as the leaves break bud. If you are not now enjoying the rush of spring blossoms and colour, this can be easily fixed. I have just been given a present of Rhododendron ‘Cosmopolitan’. It is in full bloom and its cerise pink flowers are absolutely stunning. This will grow quite big, but is easy to grow and is suitable for most gardens. Rhododendron ‘Cunninham’s White’ is also about to flower in my garden. Its pinkish buds will soon open to white flowers. Rhododendron ‘Wren’ is a petite alpine with abundant clear lemon flowers over rounded green leaves that turn bronze in winter. This diminutive plant is flowering now and is perfect in an acid bed in the shadows of Acer Negundo ‘Flamingo’. This Acer is great value for money. It is hardy and fast growing. The leaves open light pink turning green with white and pink variegation. 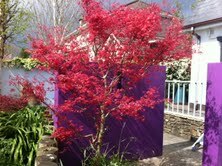 Acer ‘Flamingo’ makes an excellent specimen tree for a small to medium sized garden. A little further away in the same bed I have a beautiful Acer Palmatum ‘Sango-kaku’. This is ideal for small gardens but needs shelter from strong winds. Its leaves open orange/yellow contrast beautifully with the red colour of its branches. And, at the same time, the young leaves remain a bright yellow/green while they unfurl. The leaves then turn a bright green in summer, pink in autumn and ultimately pure pale lemon before they drop. It is positioned just outside our sunroom window where I enjoy it all year round. You can take your pick from any of the fruit trees for a spectacular display in your garden now. Malus ‘Red Sentinel’ (crab apple tree) has a profusion of white pink flowers. I am looking forward to its neighbour Cornus ‘Eddies White’ to strut its stuff in a few weeks time too. Acer Palmatum ‘Shindeshojo’ is a pure knockout and my list of must haves. See it in this picture up against a purple wall. What an explosion of colour this can bring to any garden. Nangles Nurseries have them in stock and I think a trip beckons for me. · Choose a nice sunny spot with good fertile soil, add some organic matter, and sow some mange tout. Remember, even if the packet says they are self supporting, I always find it necessary to provide support in the shape of bamboo canes. · My lettuces, mixed leaves and rocket are coming on outside. When it comes to lettuces I stick to the ‘cut and come again’ types and sow regularly throughout the growing season to ensure a continuous supply. · Control weeds around fruit trees and bushes as they compete with them for water and minerals which will reduce growth and crop yield. Give a feed of potash if required. · Sow seeds of carrots, cabbage, cauliflower and broccoli. And as soon as possible, sow onion sets.